Making sure you choose the right chair sizes is critical. Ergonomists, physiotherapists and health specialists agree that good posture is not just the key to skeletal and muscular health, but also a stimulus for concentration. 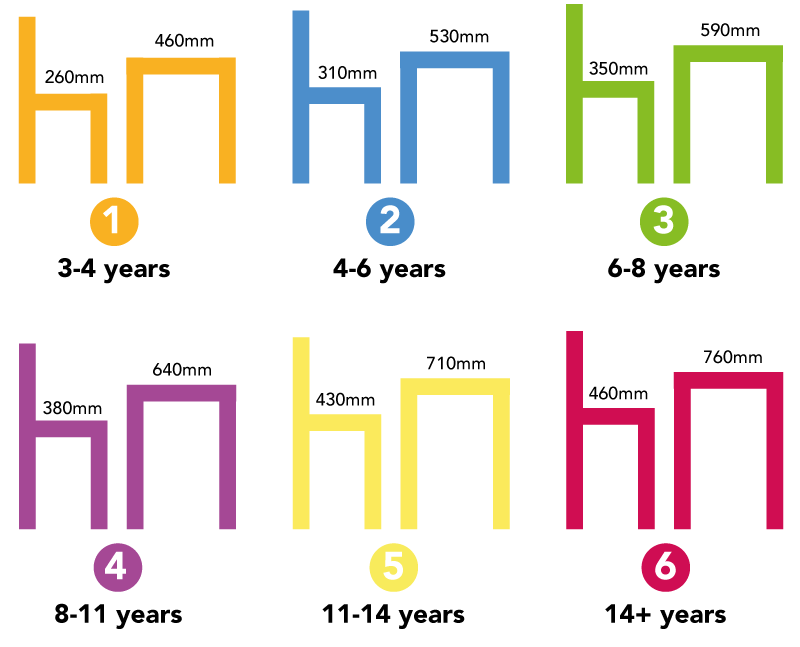 This increased awareness has led to the new European Standard EN1729 being created to set out dimensions for school furniture based on size marks and extra heights for improved posture. Height compliant furniture has the benefit of increased pupil satisfaction and likely improved educational outcomes over time. Aware of the fact that between the ages of 5 and 16 children are likely to spend around 15,000 hours sitting down, we have embraced this legislation ensuring that nearly all of our furniture is height compliant to EN1729. Most of our furniture, comply not only with the height aspects of EN1729 but also recommendation as to seat shape and design to remove pressure points, lumbar support, back dimensions etc. To comply to EN1729 regulations, use the height charts below for chair sizes when ordering your furniture. Make sure that tables and chairs you order to go together are in the same grade. No ages are recommended by the sizes due to the varying individuals in each class. NOTE: A tolerance of +/- 10mm is generally considered acceptable.